Heroes in a competitive field. Playing mid in professional Dota 2 is like being the frontman of a band. When you’re the midlaner, you’re the guy your team looks to for the big plays. The player that can completely turn a Dota game on its head. There’s a reason why, when you join a game of solo queue, mid is the first position anyone on your team calls. It’s easy to be inspired by any of the names on this list. Midlane is probably the most difficult position to master, but often offers the most bountiful rewards. The names of professional mid players are always on an audience’s lips. From hyper aggressive players like QO to straight up lane dominators like SumaiL, the variation in both player and hero matchups in this lane always makes for a great show. SumaiL is one of Dota’s biggest success stories. Born and raised in Pakistan, a country that isn’t well known for producing esports pros, SumaiL started playing Dota at the age of eight. Since then he’s moved to the USA, become a key member of team EG and won an International. All impressive feats. Even more impressive when you find out he was born in 1999. SumaiL joined EG (one of the biggest names in esports, let alone Dota) when he was 15. Then, seven months later, he won TI5. What makes SumaiL such a great mid is that his team know that, no matter what, he will win that lane. If the enemy team pick to specifically counter the hero SumaiL is taking mid, chances are he’ll beat them too. His laning mechanics are exemplary. If you want to become a better midlaner, watch SumaiL replays. And if you’re going to watch one in particular, watch this one. Game one of the TI5 grand finals, 16 years old, feeds three deaths early in the game, finishes the game 7k net worth ahead of the opposing midlaner. Magical. Yes, Miracle- didn’t attend the Boston Major as a player. Yes, Team Liquid have been diabolical in recent months. However, he still has the skill to quite literally render two of the best casters in the Dota community completely speechless. He started out as a relatively unknown, but extremely high MMR mid player. Miracle- joined team monkey business (who went on to become OG) in 2015, and the rest is history. During 2015/16 he established himself as one of the greatest, maybe even the greatest, player that Dota has ever seen. He became the first player ever to reach 9,000 MMR during his time with OG. Miracle- has the ability to take over an entire game on his own, dictating the speed of play to suit his team’s needs. With two major titles under his belt, all that’s left for him to win is an International, something that his sights will be firmly set on for next year. Miracle’s replacement in OG, at first Ana struggled to find his place in the new team. For some time, he was the scapegoat when anything went wrong. Fast forward to the present day, and Ana has become a crucial member of the OG team that just won the Boston Major. In 2015 Ana moved to Shanghai from Melbourne with the dream of becoming a professional Dota player. He took part in a tournament where young, high-skilled Dota players were given a chance to show what they could do in a competitive environment. His performance led to him being picked up by team Invictus Gaming (IG), with whom he won NEA 2016. Now a member of OG, and the only Australian player to ever win a Valve event, Ana’s aggressive but calculated playstyle has won over fans and players alike. To step into Miracle’s shoes and do just as well, or even better, would certainly have been daunting. Ana has proved to everyone that he’s up to the task. After Ad Finem’s exceptional showing at the Boston Major, it would be almost criminal not to include this name on the list. The second-place finish at the Major is both ThuG and Ad Finem’s only real standout achievement. They came into the tournament as massive underdogs, but thanks to some incredible performances, punched way above their weight. I don’t remember any game at the Major where ThuG didn’t win his lane. If there were any, there were very few. This tournament has really highlighted what this player can do. I don’t know if I’ve ever seen a more accomplished performance on Puck than in game two of Ad Finem vs Newbee. It’s not only Puck where he excels, though, as ThuG appears to have one of the most diverse hero pools in pro Dota. He seems to be able to dominate the midlaneon almost any hero, a trait that’s incredibly important if you want to be successful. For ThuG to truly establish himself now he can’t be content with a second-place Major finish. He's done it once in Boston, now he needs to do it again, and again, and again. Shadow Fiend was not a strong hero in 6.88 Dota. I’d go as far as saying he was probably one of the weakest midlaners in the game. Made of paper, and hurt beyond repair by nerfs to Raze and buffs to the jungle, he wasn’t in a good place. Then No[o]ne came along. In the first game of the Boston Major he not only crushed EternaLEnVy in the midlanebut he got a rampage. No[o]ne killed all five heroes on the enemy team in a single team fight. You’d think he’d probably be content with that, you know: one rampage is pretty nice. Over the rest of the first day he got another four. His play style reminds me of fellow Ukrainian and Dota 2 legend Dendi. No[o]ne will regularly dominate his lane. Against weaker players, if left in a one-on-one, he can beat them to a point where they have so little farm that they are no longer relevant to the game. Nerves can get the best of him occasionally, but that gets easier with experience. Remove the nerves from the equation, and No[o]ne has the potential to elevate himself to legendary status. Once ridiculed for claiming “all I want is TI, I’m going to go there whether people like me or not”, look at w33 now. Not only did he go to TI, he finished second. A super high MMR midlaner with an affinity for Meepo, w33 is one of a handful of players who can stun an audience with displays of superhuman skill. His Invoker is a sight to behold, and was the shining star in an otherwise poor Shanghai Major. Despite winning the Major in Shanghai and coming second at Frankfurt, w33 was kicked from Team Secret just before the Manilla Major. Along with former team mate Misery, he joined DC and since then has proved himself to be invaluable. Finishing Second at TI6, and third/fourth at the recent Boston Major. Some people label him as the best mid Windranger in the world, which I consider to be entirely fair. It would be really silly not to include bLink in this list. The only member of TI6 winners Wings Gaming over the age of 20, bLink is an experienced midlaner and has been a part of Wings for over two years now. He may not be the flashiest player in Dota 2, but he’s certainly proved himself to be one of the best. Consistency in the midlane is just as important as having the ability to go out and completely dominate a game. bLink very much fits this mould. His Invoker and Shadow Fiend are both impressive, but not quite at the level as some of the other names on this list. But when you’re part of one of the best teams Dota has ever seen, and you’re as stable a player as bLink, that doesn’t really matter. 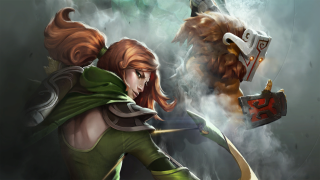 MVP Phoenix didn’t do too well at the Major, but there is no denying QO’s skill as a midlaner. He plays Dota differently to most other players, let alone other midlaners. Typing QO on a Korean keyboard means “don’t back”: two words that perfectly describe MVP’s (and QO’s) playstyle. He’s a very aggressive player. He may not get more last hits than his opposing midlaner, but he almost certainly will kill them. A lot. QO is well known for playing heroes that can commit way behind the mid tier one tower to get kills. His Phantom Assassin is one of the best (as shown at TI6), and he’s one of a few players who regularly take Slark mid lane. This Phantom Assassin game, recorded from QO’s perspective, shows just how talented he is as a midlaner. Scoring kill after kill, it’s a truly dominant performance. MVP will usually build their entire drafts around QO. On a team full of amazing individual players, that's a testament to how great he is. Dendi is a legend. He’s the reason I, and many others, got into Dota. Between TI1 and TI3 Navi absolutely dominated. They were easily the best team, and Dendi was the best mid player. While he may have fallen from the top in recent years, there’s no denying how much he’s done for pro Dota. So many of the things we take for granted in midlane were started by him. He was one of the first players who really put an emphasis on denying creeps from the enemy midlaner. This alone was enough for him to be able to dominate his lane in most games, on occasions being an entire two or three levels above his opposite number. Dendi is still one of the best at this, and his technique has inspired many other midlaners, including a few on this list (SumaiL probably most of all). During his time at the top he was also known for making crazy, unorthodox plays that no one expected. This is one of the factors that made Navi so thrilling to watch. Most games would turn into the Dendi show—especially when he got to play Pudge. This game where Dendi played Pudge at TI3 is still my favourite game of pro Dota to date. There’s an in-game set for Pudge that includes a Dendi doll hanging from his belt, that’s how influential this guy’s Pudge is. As well as being a wonderful player Dendi has a great personality. Always interesting and funny, his interviews are usually a treat. Dendi may not be the best midlaner anymore, but he’s still one of my favourites.